Unless otherwise stated, photos on this page are credited to Nasa. This is the third article in a series of guides for anyone who wants to learn a little more about the sights which can be seen in the sky at night. This page looks at those most numerous of all objects in the night sky - the stars. 'Twinkle twinkle little star' - the stars hold a fascination for little children, who find wonder in these tiny points of light, though it is a fascination which seems to be lost for many as they grow older. But it should never be lost, because the stars are amazing and bewildering, of a size, a constitution, and at a distance from us which cannot be imagined. Anyone capable of finding fascination in astonishing statistics, will find endless wonder in the stars. On this page I highlight a few of the very brightest stars, and a few record breakers in the night sky. I will also feature those patterns of stars which we call constellations, and give a few notes on some of the stars to be found in the most easily identifiable of these constellations. To see these objects, binoculars will not usually be necessary. All you need is a pair of eyes and the imagination to appreciate what you are looking at. A Beginner's Guide to the Night Sky - the identification of the types of objects you can see in the sky at night. A Beginner's Guide to the Moon - what are the surface features on the Moon which we can see from Earth? A Beginner's Guide to the Stars - stars are not all the same. Some are like our Sun, but others that we can see with the naked eye have a true vastness or a brightness which is almost unimaginable. A Beginner's Guide to Naked Eye and Binocular Objects in the Night Sky - other outstanding heavenly bodies to look out for in the sky at night. 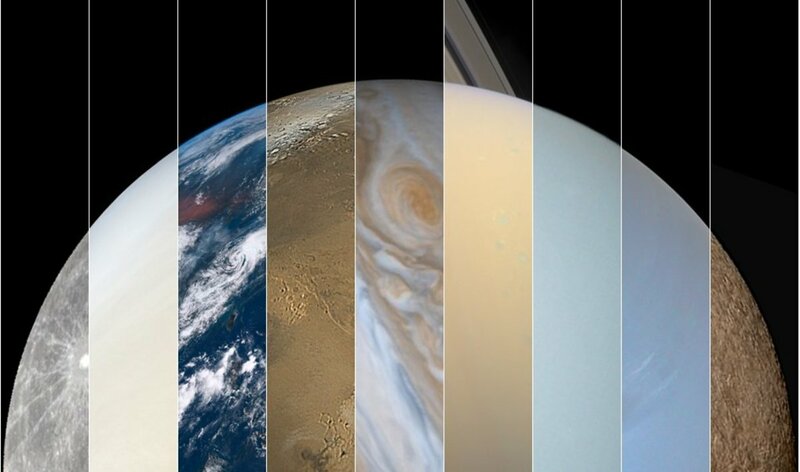 One of the great fascinations of astronomy is the mind-boggling scale of everything. The statistics - more than in any other area of human interest - are quite literally astronomical. Some of these statistics are included on this page and the next, but of course there is one unit of measure not applied to terrestrial facts and figures, which is synonymous with astronomy, and that is the light year. I wrote about the light year on Page 1 of this series, but I think it will be useful at this stage just to again put the scale of stellar distances into perspective in relation to the light year. What is a light year? Well, a light year is NOT a measure of time. It is a measure of distance. It is simply the distance that light can travel in one year. The speed of light is incredibly fast - faster than anything else we know of - indeed, possibly the fastest that anything can travel. It is 300,000 kilometres per second (186,000 miles per second). Now for some statistics, which illustrate just how distant the stars are from the Earth. The distance from the Earth to the Moon is approximately 1.5 light seconds. It takes light just 1.5 seconds to travel to the Moon. The distance from the Earth to the Sun is more than 8 light minutes. The Sun is about 400 times further away than the Moon. The average distance from the Earth to the planet Neptune, the most distant of the planets, is 4.2 light hours. 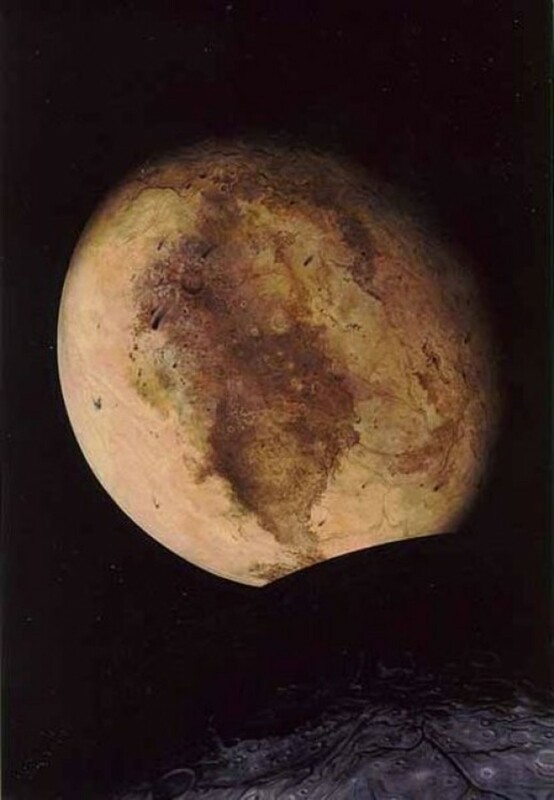 (Pluto is no longer considered a planet). The distance from the Earth (or Sun) to the very nearest star is more than 4 light years. In other words, the very nearest star is about 280,000 times further away from us than our Sun is. And if you would like a more graphic illustration, let us suppose we reduce the Earth to the size of a pea. On this scale, the Moon would be about 18 cm (7 inches) away. The Sun would be about 72 metres (80 yards) away. And the nearest star? Well that would be on the other side of the world, 20,000 kilometres (12,500 miles) distant. And most stars are much further away still.The stars are at truly immense distances. Before we discuss individual stars, we must be able to name them. The naming of stars has a very long history of many thousands of years, and some of the names have crossed cultural divides and been modified over the centuries. Three different naming systems have been employed and many stars therefore have more than one name. 1) The most conspicuous stars in the night sky have of course been known ever since man first looked upwards. Therefore, these all have ancient names and most actually derive from the work of Arabic astronomy. These are the names which will be most prevalent on this page - exotic, beautiful names such as Aldebaran, Algol, Bellatrix, Betelgeuse, Procyon, Rigel, Saiph, Sirius and Vega are all of this kind. 2) Not all stars are easily visible, and some - particularly near the South Pole - were not well known to the ancients, so don't have Arabic names. Also, although Arabic names are distinctive, unique and popular, astronomers have considered it more helpful to label stars according to the constellation in which they appear. Therefore all of the bright stars, plus many others, have an alternative name incorporating a Latinisation of their constellation and a Greek letter. Usually (but by no means always) the brightest star in a constellation is named after the first letter of the Greek alphabet, the second brightest is named after the second letter and so on. Thus, Aldebaran in the constellation Taurus, is also known as α (alpha) Tauri, and the second brightest star in this constellation is El Nath or β (beta) Tauri. In the constellation Lyra, the brightest star is Vega, or alternatively α Lyrae. In the southern hemisphere, our nearest stellar neighbour has two alternative Arab-derived names - Rigil Kentaurus or Toliman - but strangely this is one star which is better known simply by its Greek-Latin name, α Centauri. 3) Of course in the modern era, vast numbers of stars unknown to the ancients. are observable in telescopes - far too many to assign popular names or even designated letters of the Greek alphabet, so these are given star catalogue numbers and letters. One such is VY Canis Majoris. But generally such stars are not visible to beginners, and so most will not be considered here. Looking at the night sky, the most obvious visible difference between the various stars is their brightness, and we need a scale for measuring this brightness. Unfortunately the scale currently used is a convoluted modification of an ancient Greek system which categorised stars according to their 'magnitude' of brightness. For reasons we won't go into here, the brightest objects we see in the sky have been given a negative magnitude of brightness, whilst the dimmest visible to the naked eye have a positive magnitude of about +5 or +6. Now of course distance affects brightness. Just as a light bulb placed 3 centimetres from your nose will be blindingly bright compared with a massive floodlight 3 kilometres away, so the same applies to stars. So when talking about stellar brightness, we really need to specify whether we are talking about the brightness of a stars as they appear, as seen from here on Earth, or whether we are talking about the intrinsic brightness of stars - that is, how bright they would be if they were all at the same distance. Scientists refer to these as apparent magnitude and absolute magnitude respectively. The star with the greatest apparent magnitude (that is - a low or negative figure) is simply the one which looks brightest to us here on Earth (it may actually be quite dim, but just very close - like the light bulb). The star with the greatest absolute magnitude is the one which is giving off the most light, even if it is so far away from us that it doesn't look bright at all (like the floodlight above). The importance of this will become clear as we continue. We have to be aware of which kind of magnitude of brightness we are talking about. On this page, when I refer to a star as being 'bright', I am using 'bright' in its simplest sense - a bright star is one which looks bright to us here on Earth. It has a great apparent magnitude. It may not be very bright if it was viewed at the same distance as all other stars, so it may have a very dim absolute magnitude. For a simple illustration of this, consider the Moon. The full Moon is 'brighter' than any star in the night sky, and yet we all know that it generates no significant light, and only shines because it reflects sunlight and because it is very very close to us. The Moon therefore has a huge (negative) apparent magnitude of brightness (about -13), but an extremely dim (positive value) absolute magnitude of brightness. 1) With the naked eye you can sweep the heavens. You can view stars to the north, south, east and west and compare their brightnesses in an instant. You cannot do this with binoculars, much less a telescope. With the naked eye you can gain an overall appreciation of the sky and the more prominent constellations featured on this page, and see a whole constellation within your field of view, which allows you to quickly and effectively compare what you see, with what it shows on the star map. 2) With binoculars, far more stars become visible than are printed on any star map. This can make the lay out of constellations confusing - instead of seven stars which make up the 'Big Dipper' or 'Plough', you see dozens, and sometimes it's difficult to appreciate which stars are the ones you can see on the star map. 3) Frankly, because the stars are so far away, even in binoculars (or telescopes for that matter) they only appear as pinpricks of light. You cannot see more detail just by trying to magnify them with optical equipment. Binoculars are better for looking at the Moon, or at other objects such as comets and galaxies rather than stars. For all that, binoculars certainly have their place for the star gazing beginner. They help you to make out the faintest constellations which you will want to do after visualising the more prominent ones. They will allow you to see binary stars, which cannot be separated by the naked eye, and they sometimes seem to make colour differences between stars more distinct. Above all they will allow you to see the beauty of open star clusters, which we will talk about on Page 4. The constellations, as I pointed out in the first of these pages, have little genuine astronomical significance. They are for the most part merely patterns in the sky, and usually patterns which are scarcely decipherable as the animals and objects which the Greeks imagined them to be. Nonetheless, the constellations are of practical benefit to astronomers, and indeed in recent centuries the constellations have been expanded in size and added to - firstly in order to chart the southern hemisphere night sky unknown to the ancient Greeks, and secondly to fill in those sections of the sky in which the Greeks could see almost nothing, but which we - with powerful telescopes - know to be full of dim stars and other objects. Modern scientists do have a more accurate way of defining the location of a heavenly object - they use two coordinates called Right Ascension (R.A) and Declination (DEC), which effectively work like latitude and longitude on Earth, using numbers and degrees to describe a precise position, but - like latitude and longitude - they are not so easy to bring to mind. On Earth, I could say that the city of Algeciras is at latitude 36° 7′ 39″ north and longitude 5° 27′14″ west. Mean anything to you? No? If I say it is at the extreme southern tip of Spain, people will immediately have an idea of its location. It's the same with R.A and DEC. Describing a location in terms of the constellation the object is in gives a much better visual impression, than using R.A and DEC.
Don't get me wrong; understanding R.A and DEC are essential for anyone pursuing astronomy in depth, but even professional astronomers will use constellation names for easy reference purposes. Sadly, even using constellations is not always that easy. Many are vague and rather faint to our eyes, especially in these days of light pollution. However, there are some which have a distinctiveness which makes them very easy to spot, and these can be used to begin a study of the night sky. Learn the positions of these, and gradually the positions of the other constellations and stars will fall into place. On this page I will consider just a few such constellations, though a few others will also be mentioned on page 4. In this section we look at one of the best known constellations, Ursa Major, and its little brother, Ursa Minor, and how these two constellations can be used to locate the most famous of all stars. Ursa Major or the Great Bear is one of the most northerly constellations, and in this hemisphere will be visible throughout the year to most observers at latitudes higher than 40º north. The further south one travels, Ursa Major will be seen closer and closer to the northern horizon and as one moves to the most southerly latitudes on Earth, so it disappears from view altogether. Ursa Major is one of the largest of all constellations, covering a wider region of sky than many people realise - the seven stars most people recognise as Ursa Major are actually only a small part of the constellation, the part known as the 'Plough' in Britain, the 'Big Dipper' in America, or the 'Saucepan', because of its shape. Most of these seven stars are believed to be between 70 and 100 light years distant. One is particularly interesting. Mizar - the second star of the 'saucepan handle' seems to have a close companion when viewed in binoculars. But this is only a line of sight phenomenon; Mizar and Alcor - the second star - are not really associated. Close to Ursa Major and of a similar shape, albeit reversed in orientation and much less distinct, is Ursa Minor, the Little Bear. If we think of Ursa Minor as a 'Little Saucepan' then the final star of the handle of the Little Saucepan is the most famous in the night sky, Polaris - the North Star or Pole Star. The best way to find Polaris is probably from the more distinctive constellation of the Great Bear. Drawing a straight line between Merak and Dubhe - the two end stars of the Plough or Big Dipper - and extrapolating it, brings you to the Pole Star, as can be seen in the illustration below. Ursa Major, Ursa Minor and the Pole Star as they actually appear in the night sky. Follow the two pointer stars of Ursa Major - Merak and Dubhe - to find Polaris, which is believed to lie about 430 light years distant. The Pole Star is the best known of all stars in the night sky, and because of this some assume it possesses some special properties - perhaps it is the biggest and brightest of all the stars? Actually, the Pole Star or Polaris, to give it its Arabic name, is certainly a big star - a giant, with a diameter at least 30 times greater than our Sun. It is also intrinsically a very bright star, more than 2000 times more luminous than our Sun. But believe it or not, there are many bigger, hotter stars. And to our eyes here on Earth there are many stars which appear brighter than Polaris. It looks ordinary, only just scraping into the top 50 brightest stars in the night sky, as seen from the Earth. What makes Polaris so special is purely and simply an accident of location in space. This star just happens to be extremely close to a point in space directly above the northern axis of spin of our planet. As a result of this fortunate occurrence, Polaris proved an invaluable aid to early navigators in determining exactly where they were and in which direction they were headed. Incidentally, if you are interested in photography, then Polaris offers the simplest and one of the most intriguing of subjects for astronomical imaging with the most basic of equipment. 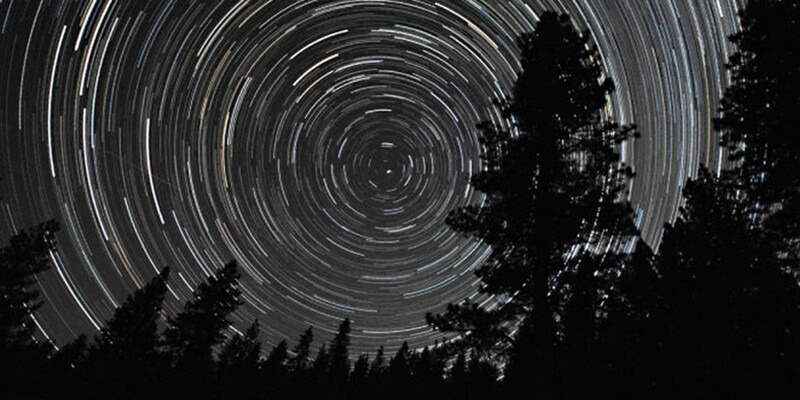 Place a camera on a secure tripod, point it at the Pole Star and set a very long time exposure. The resultant image will show a series of concentric arcs around a central point of light. The point of light will be the Pole Star, and the concentric arcs, will be the trails of light left by other stars as they apparently move around Polaris during the period of the exposure. (Of course they are not really moving around Polaris - they just appear to move as the Earth spins on its axis, whilst the Pole Star - because of its location above the point of spin - will stay put). Cassiopeia is a very easily located and a very distinctive 'W' shaped northern constellation on the opposite side of Polaris to the constellation Ursa Major. Once found, it is unmistakable. This is a good example of how a constellation is merely a line of sight phenomenon; there is no relationship between these stars. Indeed Cih (also called Tish), at c600-750 light years, is more than 10-15 times further away than Caph. This time lapse video, uploaded by Scottie M3, shows some of the most prominent equatorial stars and constellations, as they appear to the naked eye. 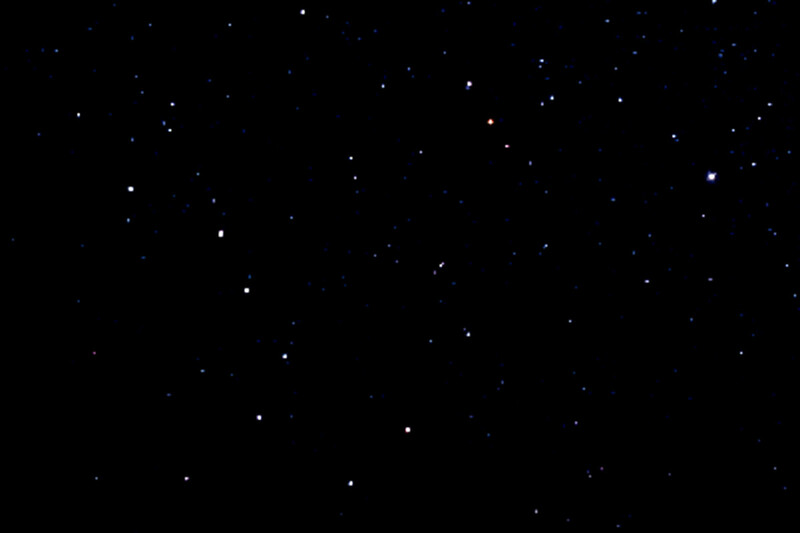 At the start of the video the Orion constellation lies low centre. At 15 seconds, the bright star which is just disappearing centre top is called Aldebaran, in the constellation of Taurus. At 25 seconds the star rising above the trees is the brightest of all - Sirius - in the constellation Canis Major. Over to the left is Procyon which is in the constellation Canis Minor. Like Sirius, Procyon is a near neighbour of ours. The constellation of Orion is a grouping of stars which lies over the equatorial region of Earth, and as such will be visible all over the planet, though only during a part of the year. Basically this will be the period around November to March (the winter months up in the northern hemisphere and the summer months in the southern hemisphere). In the middle months of the year around June to August, Orion will be 'behind' the Sun, and therefore invisible to all. When it can be seen, the constellation will appear almost directly overhead in equatorial regions, but the nearer one moves toward the north or south poles, so the constellation moves closer and closer to the horizon and remains in vision in the night sky for shorter and shorter times. It is indeed fortunate that Orion can be seen by everyone at some time of the year, because this is certainly the most spectacular of all constellations. Orion is supposed to represent 'The Hunter' in Greek mythology, and unlike most of the patterns in the sky, in this case the representation is clear, at least in the northern hemisphere. Three bright stars close together form the belt of the Hunter, and hanging from the belt is a 'sword' composed of several fainter stars and a cloudy patch of light (which is discussed in page 4). 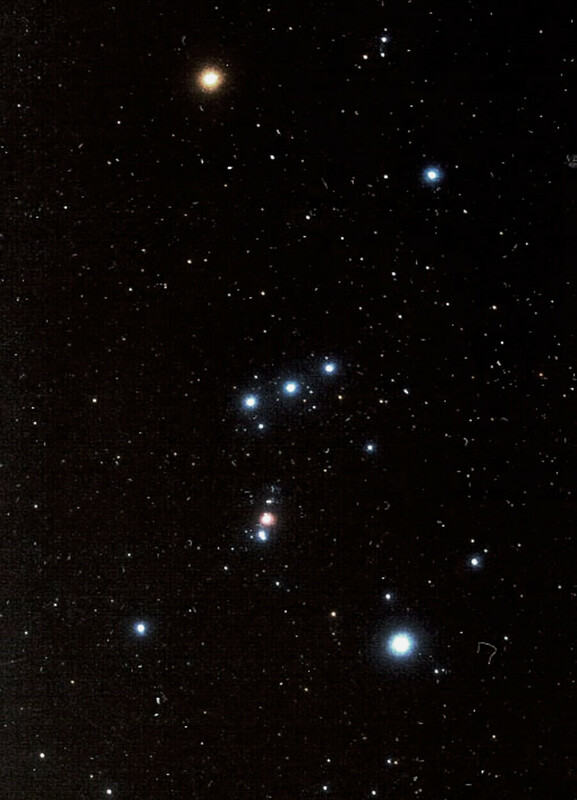 Up above the belt are two more bright stars - the shoulders of Orion, and below the belt are another two bright stars which represent the hunter's feet or ankles. (In the southern hemisphere this imagery is somewhat spoiled because the 'sword' will be above the 'belt'. And at the equator, the constellation will appear to be 'lying on its side'). 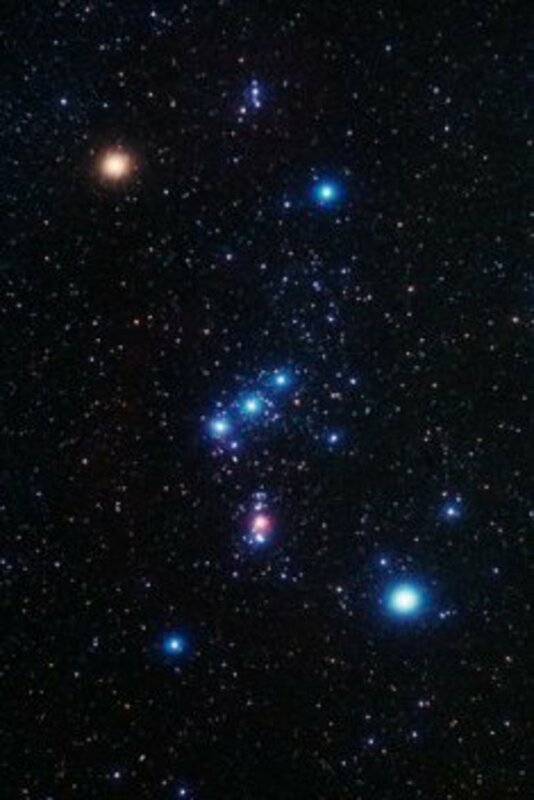 Orion is not however, merely the most spectacular looking constellation of all - it is also home to some very special stars, as we shall see shortly. The constellation of Orion is certainly one of the most prominent and easily identifiable star patterns in the night sky. But in conjunction with the nearby constellation of Canis Major, this is also an ideal location for illustrating the quite extraordinary range of stars that exist in our region of the Galaxy. Let’s take Orion first. All the main stars are quite bright, but two in particular stand out - the top left star and the bottom right star as we view them in the northern hemisphere. 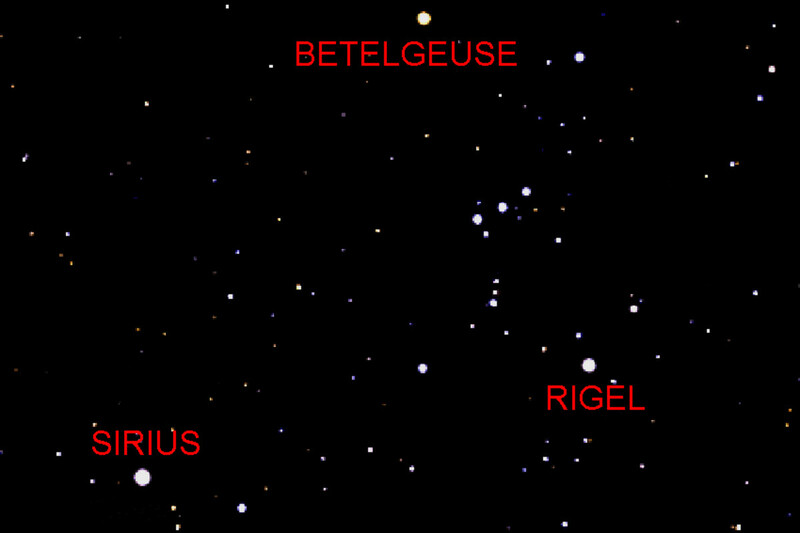 These two stars are called Betelgeuse and Rigel respectively. 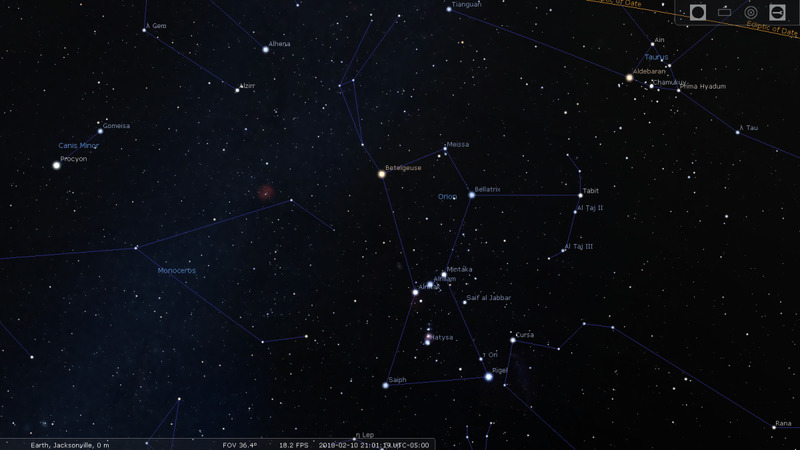 Now take a look at the constellation of Canis Major, which in northern latitudes lies below and left of Orion. 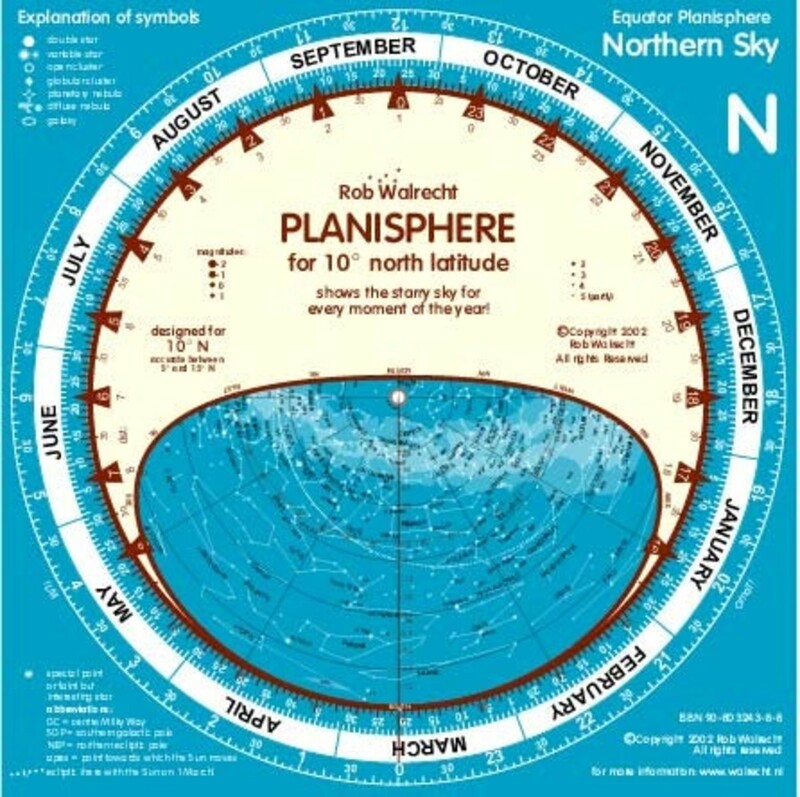 (In the southern hemisphere it will be above and to the right). Canis Major - the 'Great Dog' - is not very clear, but its most prominent star cannot be missed. Sirius sparkles in the sky; it is indeed, the brightest star of all in the sky, in either hemisphere of the globe, (and incidentally a useful indicator of whether a bright light in the sky is a star or a planet - if you see a 'star' which looks brighter than Sirius, then it will almost certainly be a planet). The three stars Sirius, Rigel and Betelgeuse serve admirably to illustrate the incredible unrealised variety to be found in those pinpricks of light which seem at first naked eye glance to differ only in intensity of brightness. All three are bright to our eyes, but they are bright for three very different reasons, as we shall see in the next section. If we take Sirius first, this is a star (strictly speaking it is actually a double star, the larger member of which is twice the size of our Sun) which shines out its light with an intensity about 25 times that of our Sun. That may sound impressive, but really it isn’t. There is one major reason why Sirius is so bright as seen from the Earth, and that is because it is one of our closest stellar neighbours in space - a mere 8.6 light years (81 million million kilometres or 50 million million miles) from us. Above all else it is this closeness, which makes Sirius appear as the brightest of all stars. 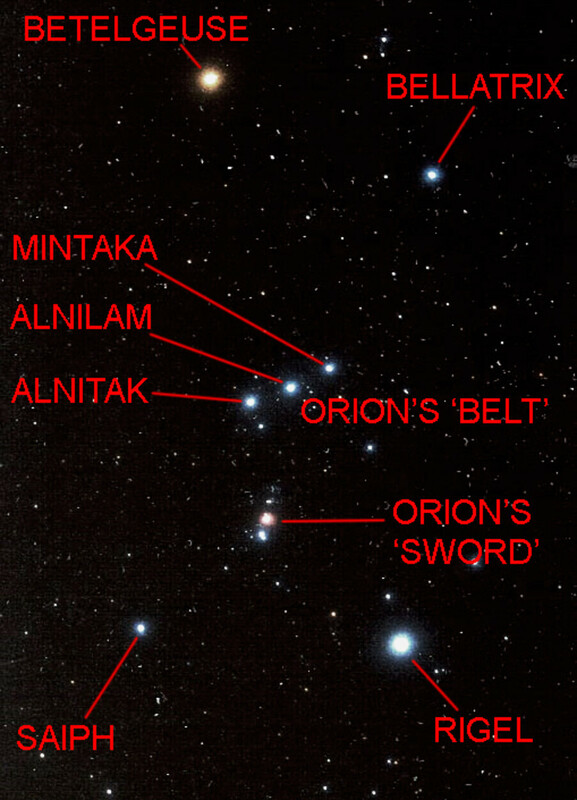 Next, we will look at Rigel, the bottom right hand corner star of Orion (or top left in the southern hemisphere). Rigel is the brightest looking star in Orion, though not nearly as brilliant as Sirius. No one would consider Rigel as superior to Sirius, until one learns a simple fact. Calculations suggest Rigel lies between 770 and 900 light years distant; in other words, it is about 100 times further away! When one realises this, Rigel blows the mind; Rigel has an ‘apparent’ magnitude of brightness slightly less than Sirius, but its ‘absolute’ brightness is staggeringly high. Why is it so high? Firstly, it is much bigger, but also it is much hotter - much much hotter. On Earth, we cannot even look at our own Sun without special eye protection, but Rigel astonishingly is at least 40,000 times brighter than our Sun - try imagining that if you can! If Rigel was as close to us as Sirius, it would be comparable in brightness to the full Moon. And if Rigel was placed where our Sun is, we would be instantly vapourised. Now let us consider Betelgeuse. This is the dimmest of these three stars to our eyes, though still it is quite bright. But take a careful look at Betelgeuse and you may see it has a distinct orangy tone to it. Now we must learn a few facts about this star. First, it is relatively cold. This is why it is orangy. It is only 'red hot' - much cooler than Rigel, cooler than Sirius, even cooler than our own Sun. Second, it is very distant - not so distant as Rigel but still at least 50 times further away than Sirius. (Sirius would be quite invisible to the naked eye at that distance). So if Betelgeuse is both cool and distant, how is it possible for it to shine so brightly? Again, the clue comes from its colour. Even though each square centimetre of Betelgeuse gives off less light than these other stars, it transpires that there are an awful lot of square centimetres. If Rigel is very big, then Betelgeuse is vast. 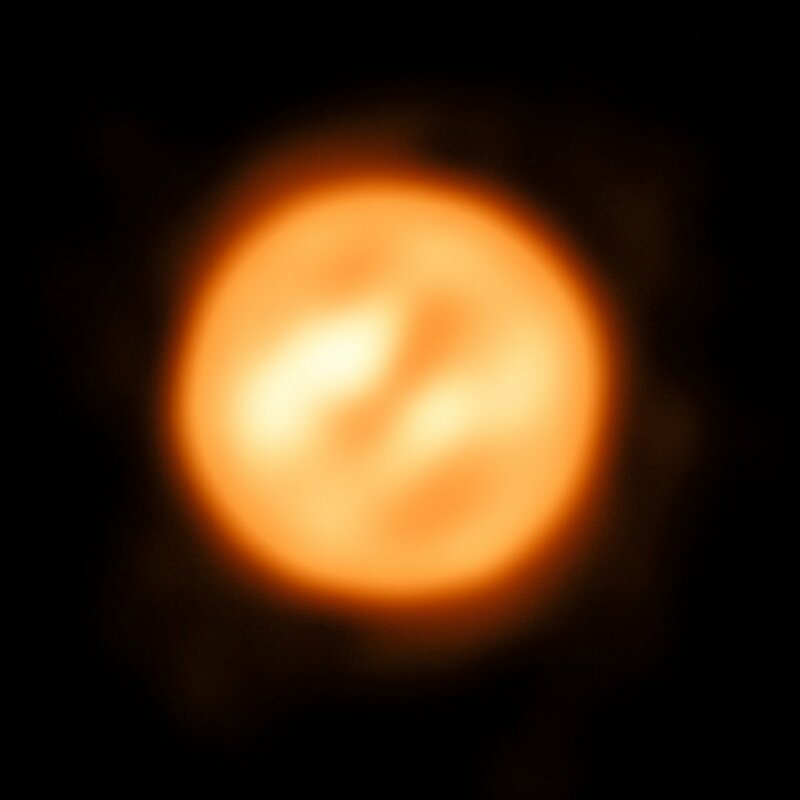 Betelgeuse is a 'red super giant' - a massively bloated ball of gas. Betelgeuse is so vast it has a diameter between 650 and 1000 times greater than that of the Sun, and a volume two billion times greater! If Betelgeuse was placed where the Sun is, then we would not see it because we would be inside it - the sphere would extend out beyond the orbit of Mars. (Incidentally, Betelgeuse is believed to be near the end of its life and will probably explode in a supernova within the next million years. When it does, it will briefly shine brighter than the Moon in our sky). So here we have three easily identifiable stars which perfectly illustrate three different reasons why some stars appear bright in the sky. Sirius is bright because it is close by. Rigel is bright because it is big and hot. Betelgeuse is bright because it is enormous. Please watch this video uploaded to YouTube by Jon S through to the end (past the credits). 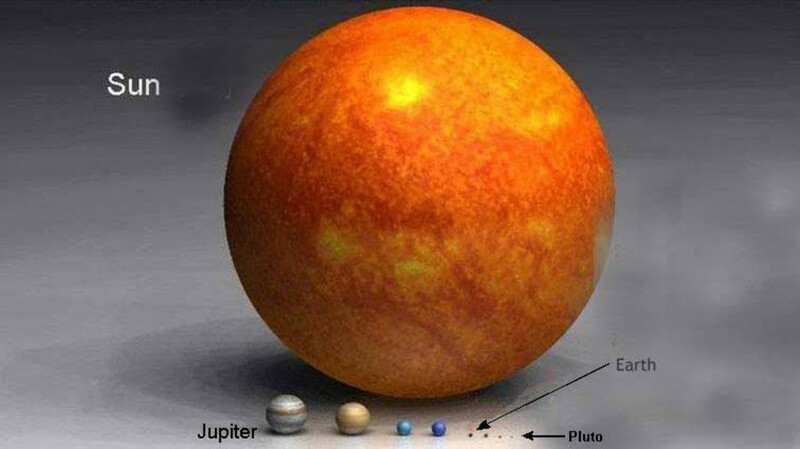 The video graphically compares the size of the Earth and our Sun with the estimated sizes of big, hot Rigel and the far more enormous VY Canis Majoris (believed to be several times the diameter of Betelgeuse). Also, the video is accompanied by beautiful music which makes it a treat to watch. But these stars are by no means unique. Sirius is not by any stretch of the imagination one of the most special stars in the sky. And there are several stars visible to us which are intrinsically more luminous than Rigel. Even within the constellation of Orion itself, there are some other amazing sights. Saiph, the other 'foot' of Orion, is believed to be similar in distance and size to Rigel, and yet even hotter. Indeed it is so hot that much of its energy is transmitted in the ultraviolet region of the spectrum, which is not visible to us, and that is why it seems dimmer than Rigel. All the stars in the belt are likewise astonishingly powerful. Alnitak and Mintaka are multiple star systems up to 100,000 times as luminous as the Sun, but it is Alnilam in the middle which deserves special attention. Believed to be almost twice as far away as Rigel, Alnilam is another star which transmits much of its energy in the ultraviolet rather than the visible spectrum which makes it dimmer to our eyes, but it shines out about 375,000 times as much energy as our Sun! It is thought to be only about four million years old, but at this rate of expenditure of energy it will not be long before it goes supernova. There are also stars bigger than Betelgeuse. some so cool they are invisible, and we only know of their existence by the gravitational influences they exert. 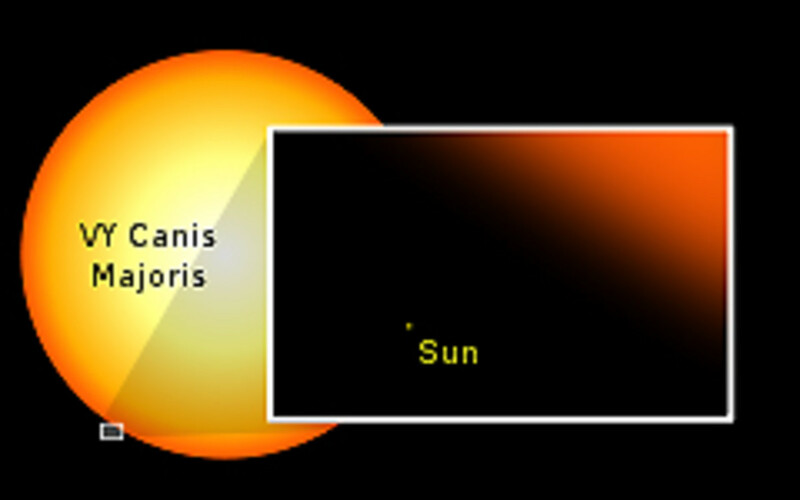 One star in Canis Major which we cannot see with the naked eye is VY Canis Majoris, believed to be up to 1800 times the diameter of the Sun (see video above, and image below). Sirius, Rigel and Betelgeuse aren't the only interesting triumvirate of stars. High up in the sky in the northern summer months (or close to the northern horizon when viewed from southern latitudes) is the so-called Summer Triangle - three very prominent stars in three different constellations. These are Vega, Altair and Deneb in the constellations Lyra, Aquila and Cygnus. 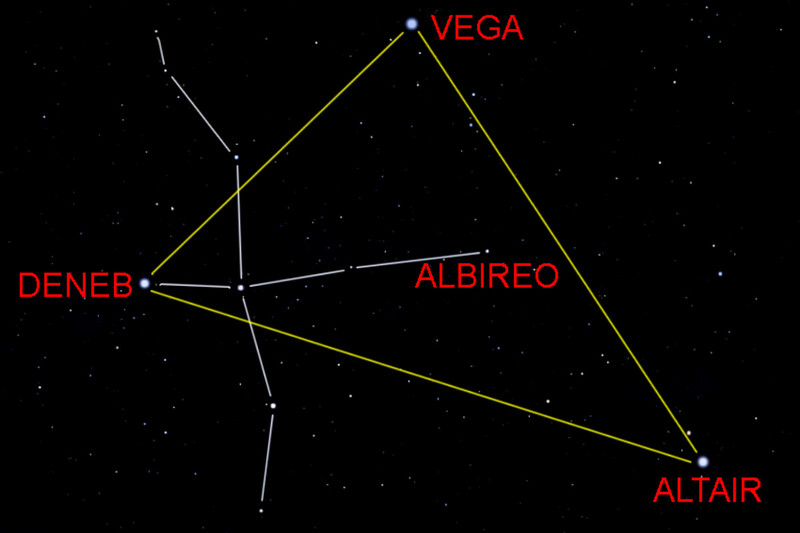 Vega is the 5th brightest star in either hemisphere, Altair is the 12th brightest, and Deneb - the faintest of the three - is the 19th brightest. But as we have seen with the stars of Orion and Canis Major, appearances can be deceptive. Deneb is another super bright massive star, quite similar to Rigel, and its comparative dimness only results from its great distance - at least 1400 light years, and maybe very much more. Deneb is tens of thousands of times more luminous than our Sun. It is the most northern of the three summer triangle stars and can never be seen by observers at latitudes beyond 45° south of the equator. Vega lies at 25 light years distant, and is one of the most intrinsically bright stars in our immediate neighbourhood (though with much less luminosity than far distant Deneb). Vega is a good illustration of how even the apparently immobile stars will gradually change their positions. About 14,000 years ago Vega sat more or less above the North Pole where Polaris is today, and will again in the distant future become the 'Pole Star' as the Earth changes its axis of spin. 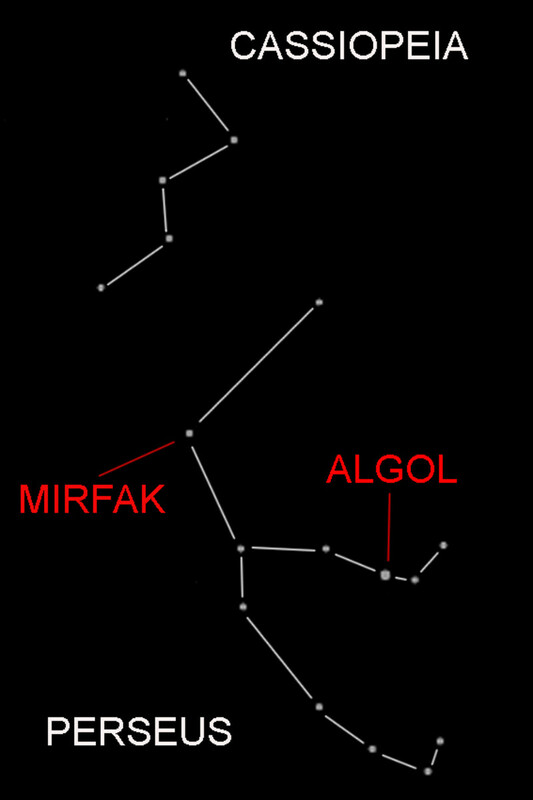 Altair is the closest of the three Summer Triangle stars at just 17 light years. 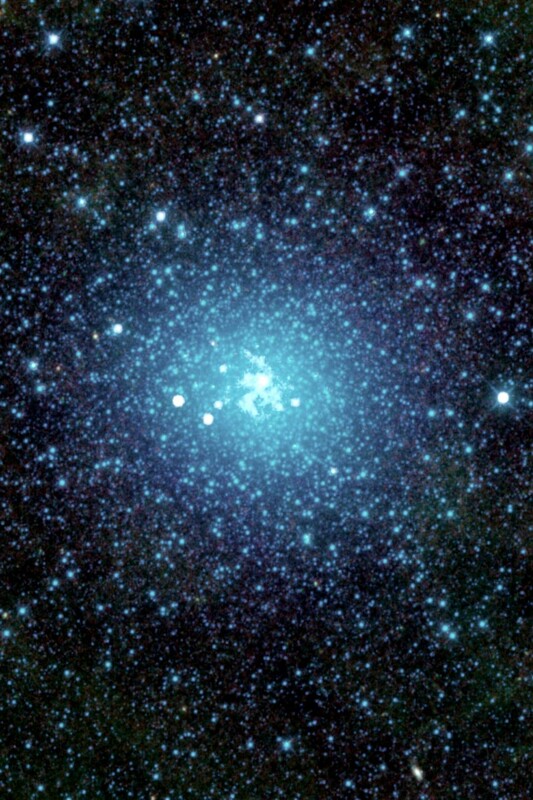 It has about twice the mass of the Sun, and 11 times its luminosity. The main stars of the constellation of Cygnus - The Swan - are identified in the image below because this is one constellation which does quite resemble the figure it is supposed to represent, with Deneb as the tail, a pair of long wings to either side, and Albireo (see next section) as the head at the end of a long neck. I will briefly mention two other stars in the northern hemisphere, because they are interesting subjects to look at for different reasons. In the constellation of Cygnus, shown above, the head of the swan is marked by the star Albireo. Albireo is a popular target for amateur astronomers. Look at Albireo through a small telescope or a pair of powerful binoculars held steady and you will see two stars close together - one orange, and one blue. These two stars both lie about 400 light years from us, and are believed to be about one tenth of a light year apart. Unlike Mizar and Alcor in Ursa Major, this is believed to be a genuine double star in which both components are gravitationally linked, revolving around each other over a period of thousands of years. In the constellation of Perseus, close to Cassiopiea, there is a star called Algol, or 'The Demon'. In other languages it has been called 'Satan's Star' or 'The Spectre'. Why such ominous names? The reason is that it was well known to the ancients that there was something strange about Algol. Unlike most stars which shine with a steady brightness, Algol noticeably brightens and dims by a factor of three times once every three days. At its brightest it is comparable to Mirfak (Perseus's brightest star) and it matches the brightest of the 'W' stars in Cassiopeia. At its dimmest, it is as faint as Segin (the least bright of the 'W' stars). So what is going on with Algol? 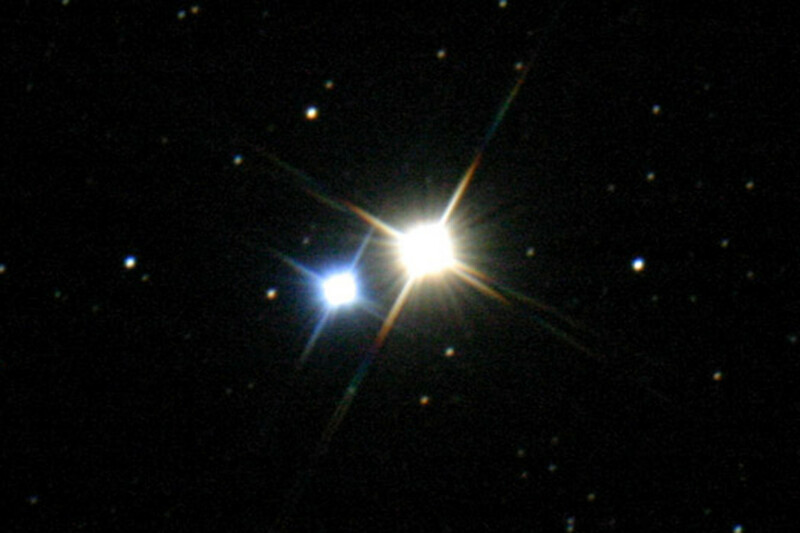 Well, like Albireo, it is a double star, or 'binary star', but unlike Albireo, where there is a very considerable distance between the two stars, the distance between the two stars of Algol is only about 5 million miles (roughly one twentieth of the distance between the Earth and the Sun) so they cannot be resolved into separate stars even in telescopes. One is a bright dwarf star, and the other dimmer component is a cooler giant star. These two stars are orbiting each other in a plane directly in line with us, so when the fainter star moves in front of the brighter star, the light from the bright one is dimmed for about ten hours. Because the dimmer star 'eclipses' the brighter one, Algol is called an 'eclipsing binary'. In this review of constellations and distinctive stars in the night sky, we finish with two constellations and two stars clearly visible only from south of the equator (or close to the horizon from the tropical northern hemisphere in winter). Unlike the northern hemisphere, there is no bright star very close to the South Pole. There is, however, a distinctive constellation shaped like a diamond, or kite, or a cross, nearby. The similarity to a cross gives the constellation its name - the Southern Cross. Just to the east of the Southern Cross are two bright stars which can be used as 'pointers' to locate the Southern Cross. These are α (Alpha) Centauri and β (Beta) Centauri, in the constellation Centaurus. Both are distinctive, but they are very very different from each other. 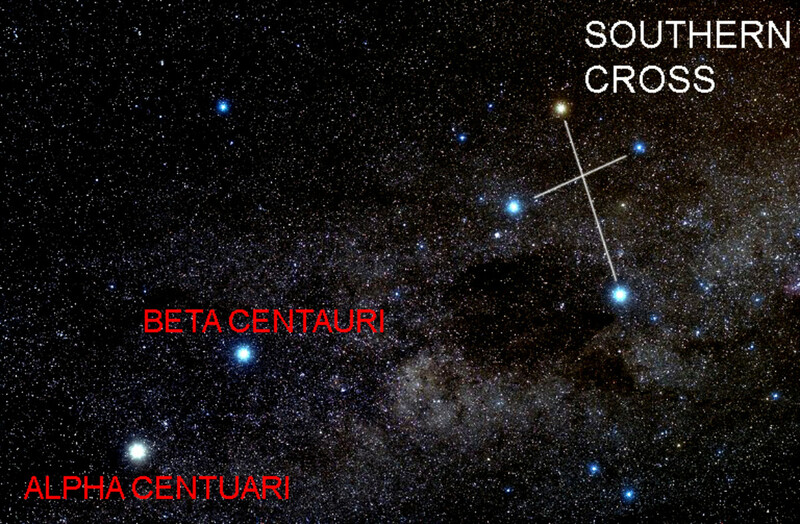 β Centauri is the star closest to the Southern Cross. 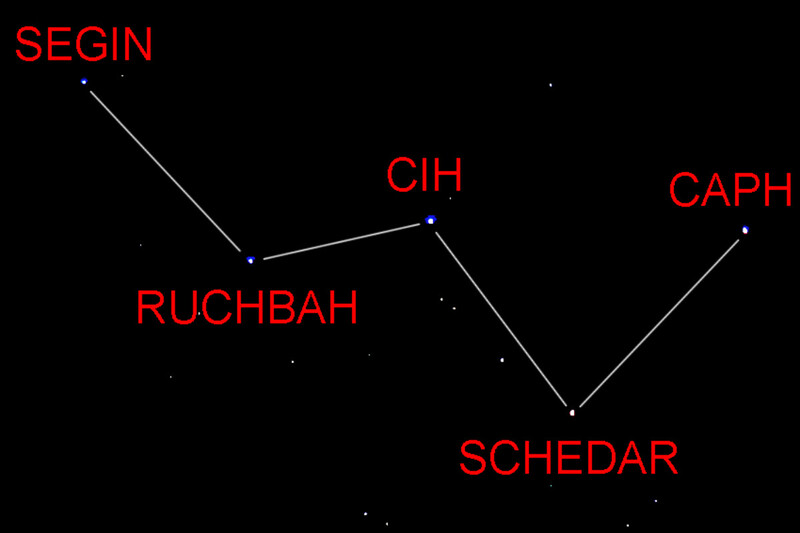 Also known as Hadar, this is actually a bright multiple star system appearing as the 10th brightest in the night sky. It lies at a distance of 300-400 light years, and the main star is a giant blue-white star many thousands of times more luminous than our Sun. Alpha Centauri is also a multiple star system, but there the comparisons end. α Centauri appears brighter in our night sky with an apparent magnitude which makes it the 3rd brightest star of all. But α Centauri is much much less impressive in terms of absolute brightness. The reason for this discrepancy is the same reason as to why Sirius is bright compared to other stars - α Centauri is much much closer to us. And indeed, this star system has the distinction of being the closest of all to our own Solar System, a 'mere' 4.3 light years distant. α Centauri will be looked at in more detail below. As mentioned, α Centauri is a multiple star system. To be exact, α Centauri is believed to be a triple star system consisting of α Centauri 'A', α Centauri 'B', and a third, widely separated component, called Proxima Centauri. Proxima Centauri is so far from the other two, that it is not yet certain whether it is really part of the same system or not, but it is actually Proxima Centauri which is currently the closest of all stars to the Sun at 4.2 light years distant. But Proxima Centauri is a red dwarf star and very dim - too dim to be seen with the naked eye or binoculars. The other stars in this triple system, α Centauri A and α Centauri B, are so close together they cannot be separated by the naked eye. Of these two, α Centauri B is an orange yellow star, slightly smaller than our Sun and about half as luminous. α Centauri A is actually very similar to our own Sun - just a little bit bigger and brighter - and could be considered our sister star. (So if you can see α Centauri you will know what our Sun would look like at a distance of about 4 light years). Brief mention will now be made of our own star, the Sun - not strictly relevant as it's not a night sky object (need I say? ), but it may be interesting to place it into context. Our Sun is what is known rather dismissively as a 'yellow dwarf' (hotter than a red dwarf or red giant, but cooler than white or blue-white stars, and also of course, not particularly large). After reading in this article about a star 375,000 times more luminous than the Sun, and another star two billion times more voluminous, one may be forgiven for feeling a bit of an inferiority complex on behalf of our own poor star. But don't. Whilst it is true that virtually every single star you can see with the naked eye has an absolute magnitude of brightness far far greater than our Sun, this is because only super bright stars are visible over great distance. There are in fact a huge number of stars which are much cooler or smaller than our Sun, including the red dwarf stars like Proxima Centauri, but we just can't see them without telescopes or binoculars. Indeed, of the 50 stars closest to us, only three are actually brighter than our Sun (the aforementioned Procyon, Sirius, and α Centauri A). All the rest are less luminous and most are much too dim to see. What's more, yellow dwarf stars burn out their supply of hydrogen fuel much more slowly than hot massive stars so our Sun will still be shining bright, billions of years after all those brighter stars have faded or exploded. Which is good news for us! 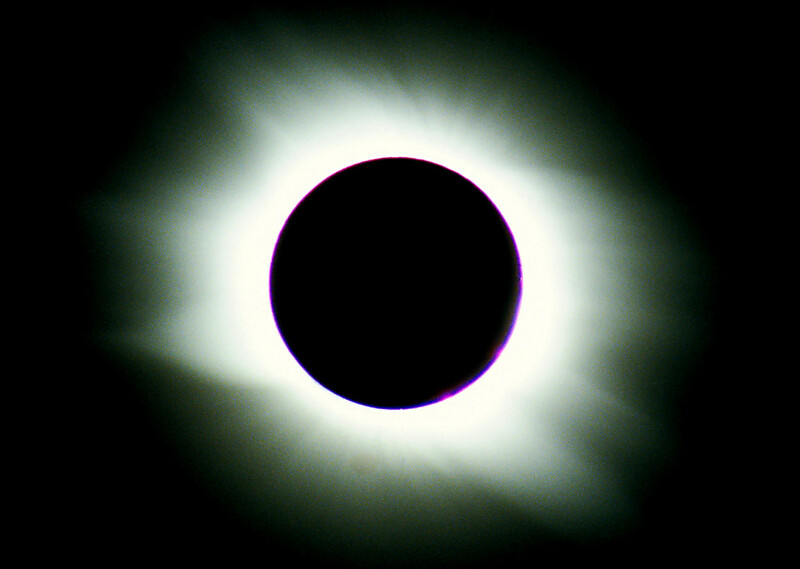 I'd like to finish with my own photo (the only one on any of these four pages taken by me) of a total eclipse of the Sun, seen in the Libyan desert in 2006. By extremely happy coincidence our Sun is approximately 400 times further away but also 400 times the diameter of our Moon. As a result the two globes appear almost exactly the same size in the sky, Consequently, if the unlit black disc of the Moon happens to pass directly in front of the Sun, then it completely blocks out the glaring disc of the Sun. However the Sun's light extends beyond the disc into the fiery corona - a region of super hot gas which is ever present, but usually lost to us in the more intense glare of the Sun's disc. Only in a total eclipse can it be seen, and it makes a total eclipse of the Sun - our very own star - the most unique and magical sight visible on Earth. Whatever your interests in astronomy, if you have any interest in the spectacular, try to see a total eclipse of the Sun at least once in your life. In this short page we have seen the patterns formed by just a handful of the night sky constellations, and a handful of the stars within those constellations. But even these few stars show an extraordinary range of sizes, luminosities and distances. Some are single stars and some are complex multi-star systems. 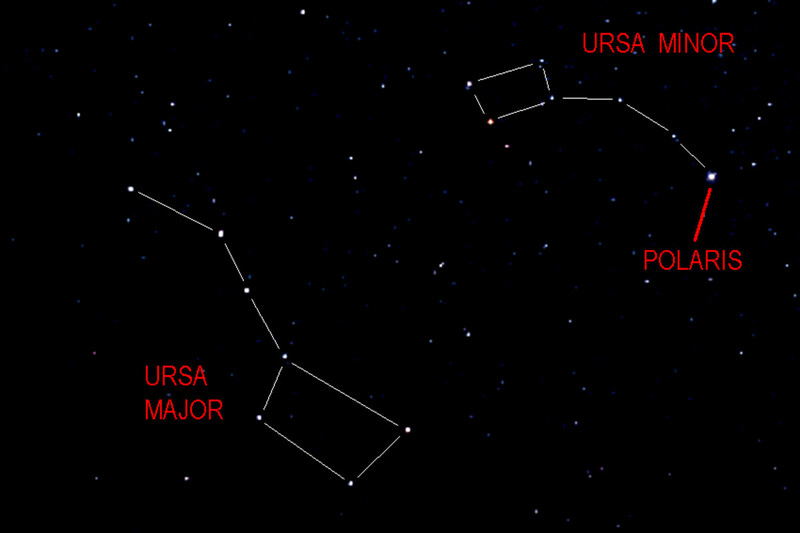 Ursa Major is easy to find and leads naturally to the less distinct Ursa Minor, where Polaris is to be found. The clear 'W' of Cassiopiea is a good reference to find constellations such as Perseus with its strange star Algol, and also the constellations of Pegasus and Andromeda (See Page 4). 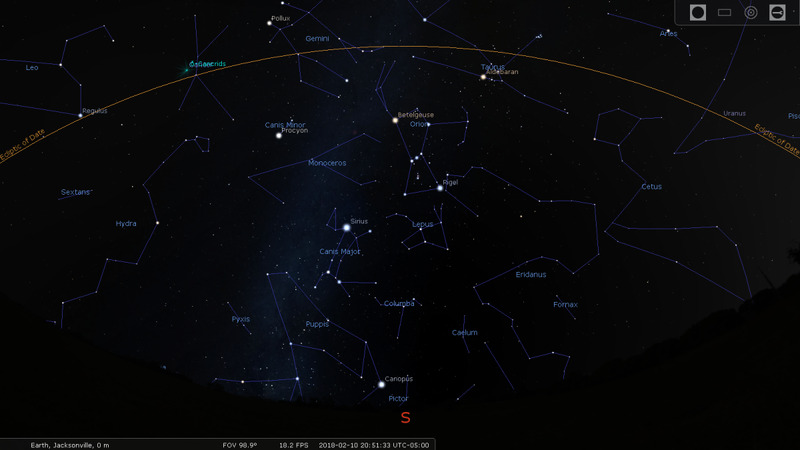 From Bellatrix in Orion, it's only a short distance northwest to the constellation of Taurus and the star Aldebaran. Whilst to the east of Orion lies Canis Major (and the star Sirius) and Canis Minor (and the star Procyon) and to the northeast of Procyon lie the distinctive twin stars of Gemini, Pollux and Castor. One can see how as you discover a few of the most familiar pieces of the night sky jigsaw, so other adjacent pieces can be slotted into place. And as you become familiar with these, so other less obvious, nearby constellations can be added to the picture. With the aid of a star map and regular viewing, it will not be long before all the significant patterns of the night sky are made apparent to you, and the main stars can be identified. The purpose of this page is simple. I would like to instil a sense of wonder about the night sky, and specifically on this page, the stars we see as mere pinpricks of light. We hear of these stars in nursery rhymes told to us as little children - ‘twinkle twinkle little star’ is how it goes. The reality of course is so much more brutal, more violent, yet so much more incredible and mind blowing. The purpose of this page will be achieved if it encourages just one person to look up at the stars and to appreciate perhaps for the first time what extraordinary things they are looking at, each one different and unique, and each one with its own story to tell. Kristen Howe; Kristen, first of all my apologies for not replying to your comment when it was first written - periodically I review my hubs and I just saw your comment which I'd forgotten to reply to! Great hub on the stars. I love stars, astronomy and the constellations. They're so beautiful and awesome. Voted up for excellent well-written hub! My pleasure Kathryn. Thank you so much for visiting and commenting. Alun. Thank you for all this great information and illustrative photos. To mention first about Libya. The eclipse was in 2006 and Libya unsurprisingly offered the best guarantee of clear skies. I didn't particularly fancy the idea of spending a week or more in Libya, so I opted for an astronomy cruise package which took in a few Greek sites and then docked off the Libyan coast. We stayed on the boat at night. In the daytime we went ashore a few times to visit some unspoilt Roman ruins in the country. Come the day of the eclipse, no less than 22 coaches ferried passengers from our ship alone about 50 miles into the Libyan desert to the best location in the centre of the eclipse path. With all the other thousands of tourists coming to watch the eclipse, and given the nature of the country, it must have been the biggest 'foreign invasion' of Libya since the Second World War! As the country wasn't geered towards tourism, they actually had to bring a whole lot of coaches and drivers in from Egypt to cope with the influx! In the desert, we all just wandered a few dozen yards from our coach and chose a spot to set up our tripods, cameras etc. Apart from the aforementioned ruins, I didn't see that much of the country except desert, but it was an interesting experience. We did have tourist police escorts at times, not for sinister reasons - it was just their way of efficiently getting us through the city traffic. And there were hardly any women on the streets - I once counted a 100 passers-by through the window and less than 10 were women. But when we did stop for snacks, the locals were friendly but quite curious - like we were an alien species! And no one asked for money or pestered us to buy anything, because they just weren't used to taking advantage of tourists. We certainly felt safe. As you'll appreciate from a previous page I wrote, I wish them well in the future in a freer, more democratic country. One can only hope it comes to pass. As for the rest of your comment, of course I must again thank you for your generous and warm comments. If these pages encourage just a few people - particularly children - to take up star watching so they can experience the kind of memories you have of childhood, then they will have been worthwhile writing. Alun, What an enthralling, intelligent, provocative introduction to the stars which is most user-friendly in its accessibility! Star-watching is one of my cherished memories of childhood with my parents and siblings. In particular, I loved Polaris, Orion and Cassiopeia. You've brought my memories to life with your illustrations and words. Additionally, the two videos were well done and welcome. It always helps to get an idea of the brightness, heat and size of heavenly objects ;-]. My favorite of all the illustrations of course is your own photo from the Libyan desert. How did you happen to be there at the time of the eclipse and what were the circumstances of the picture-taking? Such a scenario calls to mind the desert adventures of Antoine de St-Exupéry and his little prince. Thank you for sharing such a wonderfully organized and presented hub with such wonderfully inspiring content. Voted up + all (of course). Thanks physics-boy for your words - I appreciate them very much coming from a physicist! If anyone reading these pages learns how to identify just a few of the objects in the night sky, then my hope is that the sense of wonder they experience, will encourage them to go on and explore the subject of astronomy in greater depth. A very comprehensive and well thought out hub. I know how hard it can be to put science across in a user-friendly manner and you've achieved that magnificently!